This website uses Google’s Universal Analytics to help analyze how visitor use this site. Google’s Universal Analytics uses “cookies”, which are small text files placed on your computer, to collect standard internet log information and visitor behavior information in an anonymous form. Note the deliberate emphasis of anonymous. No personally identifiable information is collected about you unless you explicitly submit that information via a fill-in form on this website. So if we need personal info from you – for example your email address to register to access or add a blog comment – we will ask for it and you will have the option to provide it or not. The anonymous information generated by Google’s Universal Analytics cookies about your use of this website (including your IP address) is transmitted to Google. This information is then processed to compile statistical reports on website activity for www.nglawns.com only. We use these reports to evaluate aggregate visitor usage so that we can optimize the content, and its marketing, to better meet your needs. Yes, we consider this essential for us to operate this website as a free to use service! We will not link or seek to link an IP address with the identity of a computer user. In fact, we will not associate any data gathered from this site with any personally identifiable information from any source, unless you explicitly submit that information via a fill-in form. Google will not associate your IP address with any other data held by Google. In summary, your anonymity is safe. That is our personal commitment to you as a valued reader and potential client. Google Analytics Display Advertising Features are enabled on our site and allow us to take part in remarketing with Google Analytics, Google Display network impression reporting, DoubleClick platform integrations and Google Analytics demographics and interest reporting. Once again, the data collected for these reports is all anonymous. To opt out of Google Analytics anonymous tracking go here: https://tools.google.com/dlpage/gaoptout/. If you have submitted a blog comment or asked to be notified of updates, we request your name and email address and potentially other non-specific demographic information. For example, your language preference, gender and location. We do this firstly to ensure you are not a robot or spammer, and secondly because the more information we have on actual people (as opposed to cookies), the better we can understand what content is of interest to readers. If you wish your personal information to be removed from this site, simply contact us at info [at] nglawns.com and we will do this at the earliest opportunity. Note, that in removing your personal details all your associated content is deleted – such as blog comments you have made. Essentially we are not fans of 3rd party tracking. That said, we have embedded social “love” buttons. If you click on a social love button, most will set a third-party cookie e.g. Twitter, Google +1, Facebook etc. Unfortunately, there is no way around this if you wish to share content socially – social networks use 3rd-party cookies. Our advice is to set your browser to always block 3rd-party cookies. The social buttons will still work, just no visitor data sent to them. Natural Green Lawn Spraying offers clients the option to make electronic payments. Natural Green Lawn Spraying never sees your personal payment information that you enter when using our payment gateway provider manageandpaymyaccount.com. Manageandpaymyaccount.com offers the use of a secure server. All supplied sensitive/credit information is transmitted via Secure Socket Layer (SSL) technology and then encrypted into their payment gateway database only to be accessible by those authorized with special access rights to such systems, and are required to keep the information confidential. 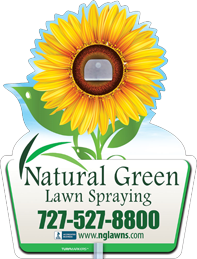 Natural Green Lawn Spraying is committed to providing the highest quality services and products for your lawn and landscape. If for any reason you are not satisfied with the recommended services provided, Natural Green Lawn Spraying will attempt to correcy any issues until you are satisfied. Natural Green Lawn Spraying will also refund any pre-payments made and/or deduct the cost of the last treatment. Natural Green Lawn Spraying reserves the right to terminate a contract with a client if a reasonable agreement is unable to be reached.